Not for the first time in my career I find that my work has led to street protests. I admit that when I began working as a chartered accountant that was not an outcome I anticipated. 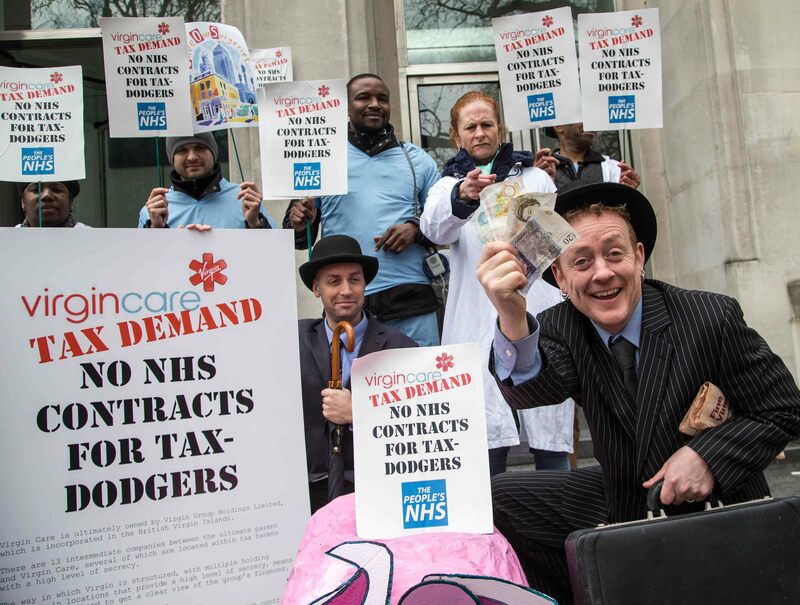 Protesters from The Peoples NHS dressed as tax collectors and doctors, accompanied by a giant piggy bank, have presented a giant tax demand to Virgin Care, following the revelation that the firm continues to bid for NHS contracts despite extensive use of tax havens. Protesters were opposing Virgin’s use of tax havens and tax avoidance mechanisms and the sell-off of the NHS. As Virgin is a company with US investors the government could be prevented from taking their NHS contracts back into the public sector unless the NHS is exempted from the trade deal TTIP (Transatlantic Trade and Investment Partnership). Virgin Care is a subsidiary of Richard Branson’s Virgin Group Holdings Ltd. Virgin uses 13 intermediate holding companies to distance the firm’s healthcare division from its parent company, which is based in the tax haven of the British Virgin Islands. The complex nature of the multinational group to which Virgin Care belongs means that it is not possible to draw any conclusions from the individual company’s accounts, including about how it is funded and its tax payments. The company does not publish a consolidated set of accounts for its healthcare operations, so it is impossible to even piece together the total revenue that it is making in the sector. Due to losses sustained Virgin Care has not paid tax in the period under review. Have we seen much of Branson’s smirking visage lately? Despite he’s been a regular on our tv screens for decades, just recently I don’t believe we have – wonder why? His tv advert premiered on Channel 4 adverts during the news this week. A quick google search shows Richard Branson was in The Telegraph 2 days ago launching a ‘entrepreneurs’ competition and The Daily Mail yesterday talking about pre-nups. He was on the BBC on 11 March talking about the Australians facing execution for drug smuggling and in The Guardian talking about liberalising drug laws on 3 March. So you suspect he’s trying to change his tax domicile status? Do you have any evidence at all of this? Or doesn’t that matter any more? What’s your point, exactly? Gulliver runs HSBC from London without any apparent prejudice to his domicile status; yet you seem to be congratulating yourself and attacking Richard just because you managed to google “evidence” of events that could have taken place from anywhere without affecting residence, let alone domicile status! I was responding intially to the vague assertions from Bill Kruse that we could infer something from Branson’s alleged absence from the media. I was pointing out that Branson wasn’t absent from the media. For Branson to change domicile would involve a claim by him that he had done so, since domicile of birth ‘sticks’ unless claimed and proved to have been broken. As such I would repeat that without evidence, guesses are little more than gossip at a street market. I would never suggest, for example, that Richard Murphy’s refusal to open up his personal tax afairs to scrutiny is because he wouldn’t want people to see what was there, nor would I imply that his maintenance of from his dual UK/Ireland citizenship should be viewed as suspect from a tax perspective just because others have done the same for tax avoidance reasons. Both Richards are entitled to keep their tax affairs secret and away from prying eyes, just as every other individual is. Is that true of the other Richard? A somewhat disingenuous statement as your LLP accounts say nothing about the amount of tax you pay, as the somewhat oblique point made by Alan was trying to highlight. Incidentally, the LLP accounts of PwC in the UK actually DO show the total amount of tax paid by the LLP members. It’s rather ironic that I know how much tax the members of PwC LLP pay but do not know how much tax the members of Tax Research UK LLP pay. The DM report was based on his writing on his blog. So why not create that tax reserve in your accounts? The calculation of tax you thought due. The following year we would see the movements in it, just as we do with PwC. You could show tax actually paid, new tax liabilities calculated etc. That’s the point. As a campaigner for tax transparency you should be taking the lead, not hiding behind what others do. Simple question you should be able to answer real soon. What was your income in 2014-15, what was the tax you paid, if there was a difference between expected and actual tax paid what are the reasons for the difference. I struggle to understand why a campaigner for tax transparency isn’t setting the lead here. Fair enough and I respect your stance. Would that be an unfair summary? Interesting that the link is to The Guardian. Aren’t there also companies within that group based in tax havens? Hey – you look silly. Yes – really!! I have heard that Virgin Care etc pay nurses a bit more than the NHS and lots of staff are leaving. I am I seeing a pattern here of weakening the existing service so that it is closed and replaced? Or am I a suspicious, grumpy old man? I’d imagine its still a helluva lot cheaper than paying to train your own nurses as well ?! I work on government tenders for a living, and am puzzled by this protest. Let’s say I am 100% behind this protest, what is it they are asking me to do for my next tender? Please tell me! And before you impute that I am sympathetic with tax avoidance, I’m not. But I realise that if I put something in my tender documents to exclude bidders who engage in lawful conduct of which some politicians or senior officers disapprove, it would result in exclusion of a lot more than just Virgin. What about people who have extra marital affairs? Divorcees maybe? State school people? Private school people? Labour voters? Tory voters? I have a pet hate of men who abandon their kids (something a lot worse than tax avoidance). Should we exclude them too? If the change in the law they are demanding is that companies that obey the law but not in a way that they like should be barred from public tender then it does, as Adrain suggests, open up a can of worms. Suppose I disaprove of individuals that seek the financial protection that the UK legal system provides of limited liability through forming an LLP without those individuals detailing what tax contribution they make to the system which protects them? Should I be allowed to bar them from making a living by commenting on a tax system they have provided no evidence that they contribute to? Some would say that was a valid point of view. Adrian, you’re correct, a lot more than just Virgin behave in bad ways permitted by law but never intended by Parliament. It sounds as though it needs someone above your pay grade to create a list of entitities that should be excluded. What law do they want changed? What would their proposed new law say? Would it extend to all lawful conduct politicians/officers don’t like, or just to tax avoidance? Do they know a lot of this body of law comes from Brussels – do they even know to whom their protests ought to be addressed? When it is considered that Virgin, along with other health providers, are rent seeking from a pool of national taxation to profiteer out of health, it is galling to note that they are still too greedy to pay something back into the pool. When that pool withers from cuts, they will start charging. The middle classes and poor will then pay taxes and high charges for health as they now do with rail fares. This is basically neofeudalism, whereby the poor pay taxes to the rich. Exactly. But if voters keep voting for politicians who promise to cut taxes which only leads to the costs of services going up, the voter has only themselves to blame in the long run. Sad but true. Sandra, they have contractual obligations to a willing, sophisticated and well-resourced buyer to provide services in return for payment. They’re not getting ‘something for nothing’. You suggest they are getting paid too much for too little. Maybe you’re right. But it would be helpful if you could tell us which contracts do you have in mind, and why you think they’re being overpaid. I hope to answer this giving your question the “grey scrutiny” rather than the red, just to illustrate that even being apolitical privatisation of the NHS or similar public services does not stand up. I am just comparing Nye Bevan’s model with the neoliberal model. The original NHS was intended to be non profit making, thus all of the cost went in to direct services and support. I attended a meeting of the “keep our NHS public” in Cambridge last week, the speaker was Alison Pollock. She stated that under Nye Bevans model up to the 1980s, health cost just 5% of GDP. She went on to say that it increased because of the reforms during the Thatcher era, because of various outsourcing of support and the administrative costs of having to cost every procedure. Then, under new labour, hospital building and services were paid for under PFI, which she stated “fat cats are extracting enormous financial gains.” The new NHS bill which she supports, it writes that PFI should be made the responsibility of the treasury. PFI is pure rent seeking and adds debts that far exceed the value of the buildings. Under the coalition, services and hospitals are being given to private providers who represent a tier of proprietors who are rent seeking on the public purse. They do not actually provide value, in the way that doctors and nurses do. Nye Bevans model of the NHS did not need, or contain this wasteful layer of profit and rent. The neoliberals argue that the aging population is adding costs to the NHS, the very thing they are doing by adding rent and profit. This was understood well by Clement Attlee, who facilitated the NHS. He stated that to have equal access to (health, education), we must get rid of interest, profit, and rent). In the United States, this profit and rent costs 18% of GDP – and they have worse outcomes, especially for the 50m who cannot pay. Let’s not confuse companies that rent-seek, by employing already-trained staff poached from other providers, to companies that provide services to the NHS and train their staff….etc. The NHS contracts a whole rake of service provision from external sources, most are extremely competent at the job. All the hospital services I have used in the past two years of illness have been excellent. My at-home provision of drugs and service have been an eye-opener….especially from NHS Papworth, where external provision of service and delivery is by external contractors. Interesting to note that LE [Life Expectancy] differs from HLE by a decade and a half. Not much mentioned about that in the rush to up the retirement age.